Food Metal Detection Systems are available for Hire from eight Accuweigh branches across Australia. Hiring a Food Metal Detection System minimises the financial impact on supermarket suppliers now required to comply with increased Quality Assurance standards. Recent changes to supermarket QA standards have mandated for 100% inspection for both weight compliance and metal foreign objects for all “home” branded products. Accuweigh can help supermarket suppliers comply with these recently introduced requirements with our comprehensive Metal Detection System Hire packages. 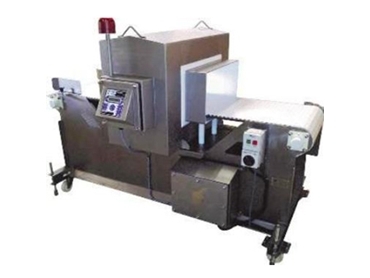 Hiring a Food Metal Detection System eliminates the need for capital expenditure for the purchase of Food Inspection Equipment and the small monthly invoices also take the heat off cash flow for most businesses. Accuweigh’s Fortress Phantom Food Metal Detection Systems utilize the latest Digital Signal Processing technology (DSP) to detect ferrous and non-ferrous metals, including stainless steel. With the highest processing power, the Fortress Phantom Metal Detection Systems are renowned for their superior speed, accuracy and ease-of-use. Typical Food Inspection applications include Bakery, Meats, Packaged Products, Ready Meals, Dairy, Healthcare, Confectionery, Fresh, Chilled, Frozen Foods.